William Percy Rowbottom was born at 8 Wardwick Street, Derby, on 18 June 1865. He was one of three Rowbottom children and had a sister Lillian and a brother Walter, though Walter died as a baby. Their father was William Henry Rowbottom, a printer, bookseller, book binder, engraver and stationer who had inherited the Derby business from his father. William Henry also sold pianos and there was a music room on the premises. The Rowbottom family originated from Breadsall and Percy's great uncle Samuel had founded the Alfreton and Belper Journal. Percy's paternal grandmother was the sister of William Peat, a Derby banker. W H Rowbottom sold some of his furniture and his stock in 1869 but when and where he died is not known. The business was subsequently taken over by an F. Carter, who was to advertise that it had been "established upwards of forty years". Percy's mother Annie (Rebecca Mary Anne Louise) was the daughter of the Yorkshire born Derby Attorney and Solicitor James Foottit. His uncle Fred (Frederick Francis) Foottit, a landscape artist and sculptor, had been a pupil of John Ruskin. Fred's artistic talent was to be an important influence in Percy's formative years. By 1871 Anne Rowbottom, then a widow, and her two surviving children were living in Green Lane, Derby with her brother Fred. They eventually moved to Matlock and were living on Matlock Bank in 1881, although Percy was not with the family. He was in West Derby, at the home of one of his Peat relatives, and employed as a shop boy in their butchery. Ten years later Percy was in Scarthin, by this time working as a draper's assistant. Both jobs could have helped supplement his income as an artist. Either that or he was painting in any spare moments. He exhibited several times in the 1880s, often alongside his uncle who must have taught him how to paint. Percy and Fred both exhibited oil paintings at Nottingham Castle Museum in 1883, for example, in an exhibition that included the work of several Derbyshire artists. Percy showed two oil paintings, one of which was called "Matlock". A newspaper critic wrote that "both [Percy's pictures] exhibit considerable care and finish, but are not in good positions as to light". He was still only 17. The following year Percy exhibited a view of Tom Moore's cottage at Mayfield as part of Richard Keene's Spring Exhibition in Derby. The family were in Ireton Wood, Idridgehay by this time, living at the Laurels on Windley Lane, and some of Percy's pictures from the period had the address "Idridgehay" alongside his signature. He exhibited at Derby Corporation Art Gallery in the 1890s. Percy belonged to a band. An early performance was at the fundraising Wirksworth Parish Room Bazaar in 1891, which ran over several days: "the famous minstrels, Messrs. J. C. Quant, Milnes, Loy, Morton and Percy W Rowbottom gave two musical and mimetical interludes intitled "Our Portfolio", which were much appreciated". They would have been in demand, both for functions and to entertain the visitors to the village. In late 1897 he married Edith Mary Baker at at Belper Registry Office. The couple moved into Glenna Cottage opposite High Tor in Matlock Dale. Percy's photographs all seem to date from after 1901 and we know he moved into the small two roomed studio on Temple Walk outside the Royal Hotel grounds. The studio had been a branch of Seamans (most probably F J Seaman, rather that Alfred) before Percy took it over. He was resident there in 1911 whilst his younger daughter was boarding with the Hockins on North Parade. Percy lived with the Hockins for the rest of his life, moving when Mrs Hockin went to live at Greenbank which she ran as a boarding house and where the stairway was lined with his paintings. He owned a lantern and produced lantern slides but it is unlikely any survived. He was involved with the Cinematograph Theatre and the Pump Room at the Grand Pavilion. Whilst the dates of his involvement are unclear, we know that one former resident, May Kirkland, worked for him there when she was a girl. She sold of a large quantity of water in one day. After the first World War Percy Rowbottom became the proprietor of the Fountain Baths and Assembly Room. The web mistresses father recalled that, when children got into difficulties in the water, he pulled them out with a loop on the end of a pole. Running the Baths and arranging Tea Dances there was to be the last commercial venture Percy undertook. 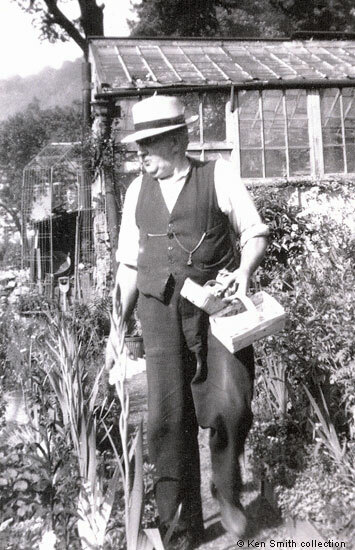 He spent his retirement years at Greenbank looking after the garden (as shown in the photograph of him, above). He died at Green Bank in 1943 and was survived by his daughter. Postcard back, overprinted "Royal Series Sunshine Pictures. Copyright Percy Rowbottom. [Sold by the] Derwent Gardens, Matlock Bath". Other cards of his were also in the Royal Series, undoubtedly because of his studio's closeness to the Royal Hotel. Photograph, receipt and card back in the collection of and provided by and © Ken Smith. Frederick Francis Foottit (1851-1935) was born at Barnsley, Yorkshire. He lived with his sister at Idridgehay for some years. 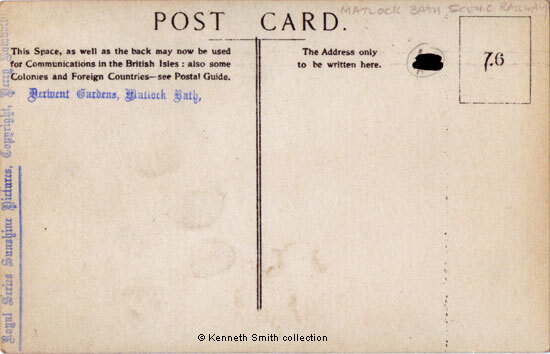 Percy's mother, sister and Uncle Frederick were living on Matlock Bank in 1881 (RG11/3450 f99 p2 s7). Another uncle, James A Foottit, resided near "Rockside" (RG11/3450 f76 p18 s40). In 1881 Percy, then aged 15, was living at 201 West Derby Rd, West Derby (RG11/3711 f61 p4 s17) with his first cousin once removed, Joseph Dorman Peat. J. D. Peat was the son of Percy's grandmother's brother and had lived in West Derby for many years. It is difficult to know whether this was just a job to earn him some money, or whether Percy had seriously intended to become a butcher. Percy was in Scarthin in 1891, working for the Lennox family (RG 12/2775 f113 p2 s17). Frederick Foottit appeared in Kelly's Directory of 1891, living at Ireton Wood, Idridgehay. Fred and his nephew Percy Rowbottom appear in the 1895 directory, both saying they were artists. "The Derby Mercury", 20 May, 1891. Of the musicians named only John Cheadle Quant lived in Matlocks at the time (see the 1891 census). Though it isn't entirely clear, these men were, probably, the O.I.C.M. minstrels. The 1911 census, showing the Hockins and Percy's daughter at No.2 North Parade, is available on Find My Past (external link, so will open in a new tab or window). Lucy Kate Hockin (nee Pragnell) was born in Sherbourne, where her father taught at the public school. She married the jeweller Herbert Edwin Hockin in 1902. Herbert and Percy died within a few weeks of each other. From the recollections of the late Mr. Frank Clay contained in private papers and notes owned by Mrs. Doreen Buxton, some of which were written in 1992 and are still within copyright.